Domain Name System or DNS is a global hierarchical distributed naming system for computer and or services. This service translate domain name to IP Address. For example, google.com to 74.125.68.102. 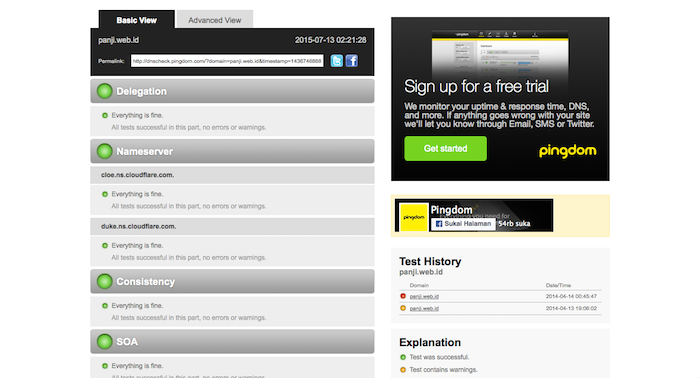 You might already heard about Pingdom from its free uptime monitoring service. 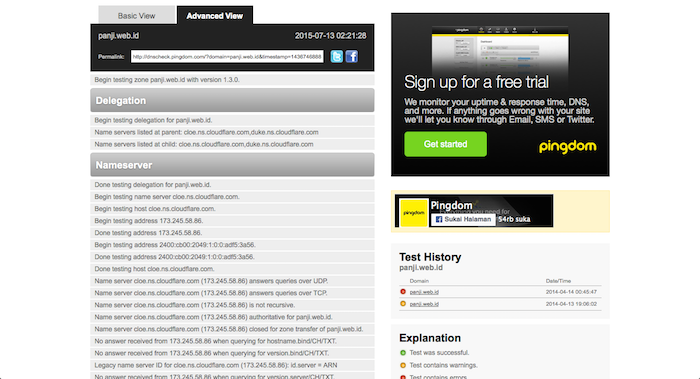 Pingdom also provide free tool for DNS Checking. 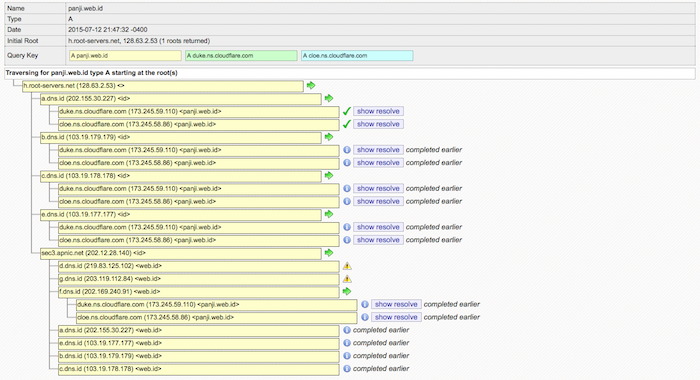 It will check Delegation, Nameserver including dns reverse entry for the nameserver itself, consistency across nameserver, SOA, connectivity and DNSSEC. The output page available on two version the Basic View and Advanced View. 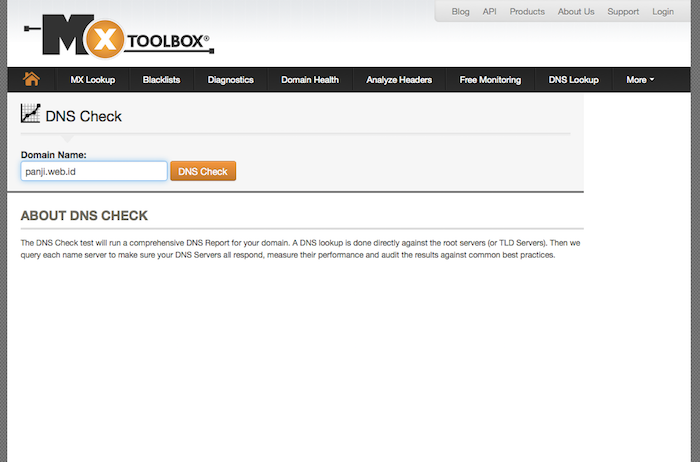 The Basic View gives you summary on the healthyness of your DNS. The Advanced View Provides detailed test result for your query. Whatsmydns.net allow us to perform DNS lookup for specific type of record. 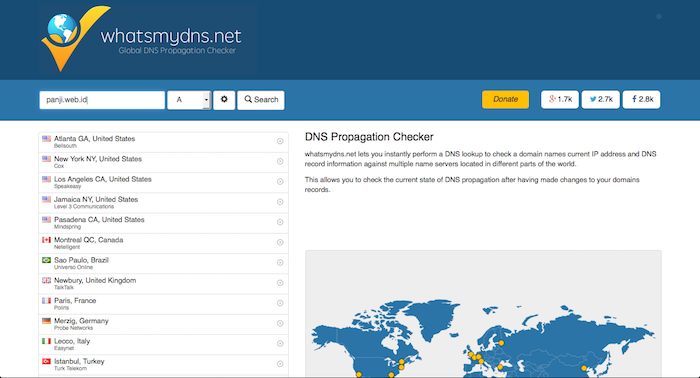 With this tool you can check the status of DNS propagation after you made changes to your domain. You need to input dns record / hostname and type of DNS record for example A, AAA, CNAME, NS, MX and TXT. 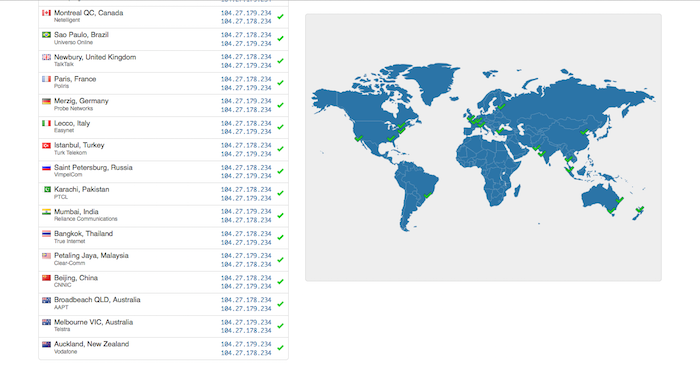 The result will show result status from 21+ location that whatsmydns.net have. It will also show the status on world map. MX Toolbox also provide free dns checking service. Don’t be fooled by the name if you think it can only check MX record. you only need to input the domain name that you want to check on the input box. 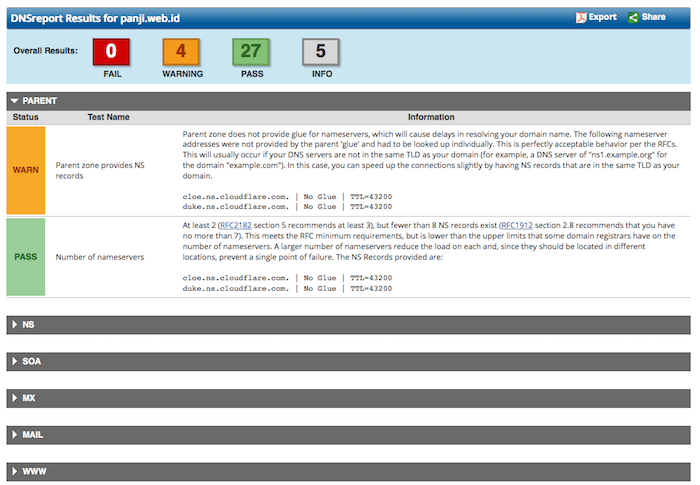 The result show summary regarding the health of your DNS and it’s record. The result example below show that the dns condition for my domain is ok.
DNSstuff also provide DNS report service on it’s website. 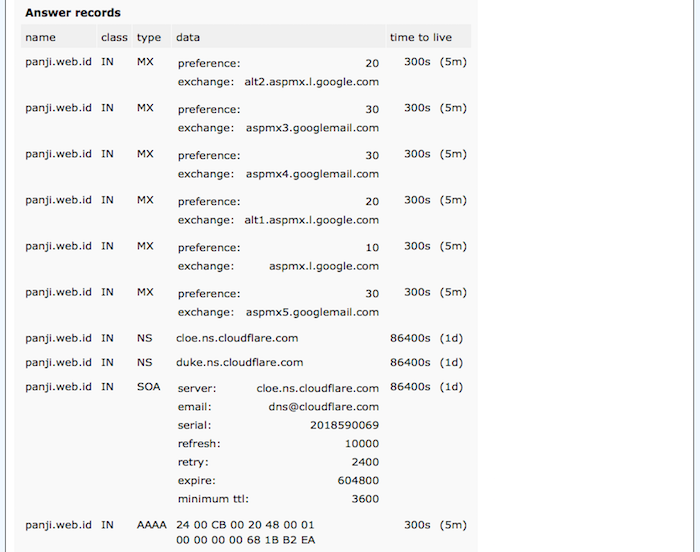 Beside DNS report it also gives WHOIS lookup and IP information service. You can input your domain name on the DNSreport input column. The result given by dnsstuff is pretty details. I collapsed most of the report on screenshot below but you can read the detailed report for the domain that you check. You can also export the report to PDF file. DNSstuff can be a good MXToolbox alternative. This DNS check provided by Stichting Internet Domeinregistratie Nederland. 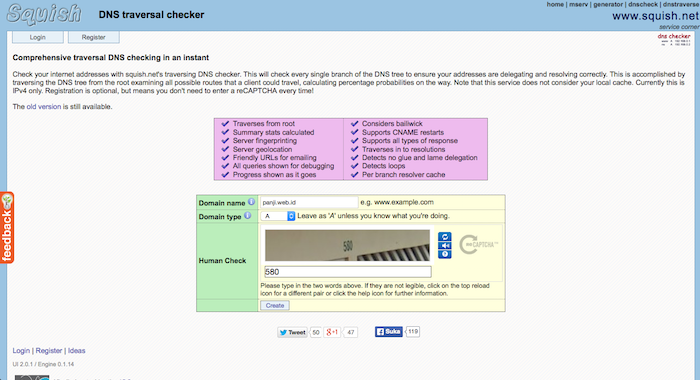 As any other dns checker it provides simple interface where you can input your domain name. The result is simple where you get green, yellow, red or grey led symbol. This show the health status of your DNS servers including its records. 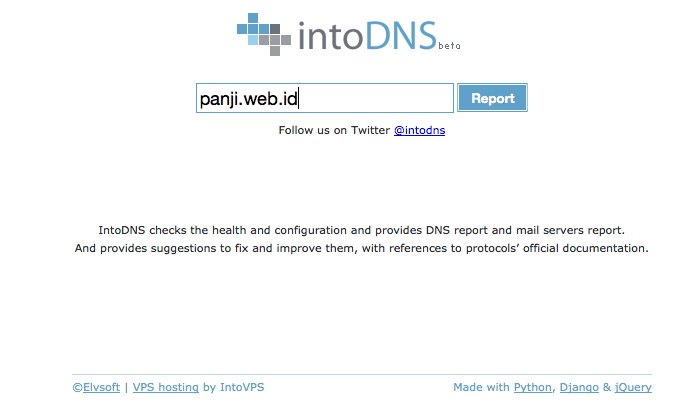 The interface of Intodns.com might remind you to Google homepage, clean. 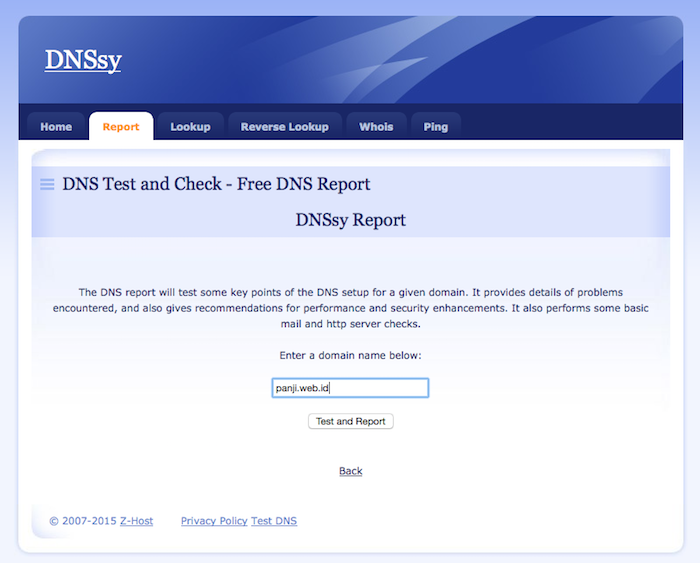 After you enter the domain name and click report it will show your dns server health status. The report is categorized into Parent, NS, SOA, MX and WWW. Squish provide a little different service which is DNS Traversal Checker. As usual, you have to input the domain name that you want to check and you have to select the dns record type that you want to test. The result will show you the process of resolving your domain name from the root server to your domain authoritative DNS server. On the bottom, it will also show the percentage of answers given by all of your DNS servers. With DNSSy you also only need to input the domain that you want to check without having to select the DNS record types. The test that DNSSy perform not only query to dns record but also ask the service that your domain use. For example it will do HELO test to your mail server and also check whether your website homepage status. 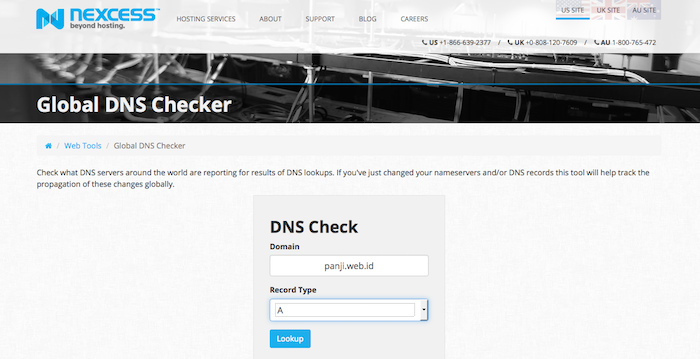 Nexcess Global DNS Checker helps you check your DNS health from 21 locations. Not all of them are nexcess.net dns servers, it also ask your DNS records from Google, Sprint, speakeasy, OpenDNS and a lot more. The result is fairly simple it will show the dns value returned by the DNS resolver. You should see all of the return value is the same if your dns servers is healthy. 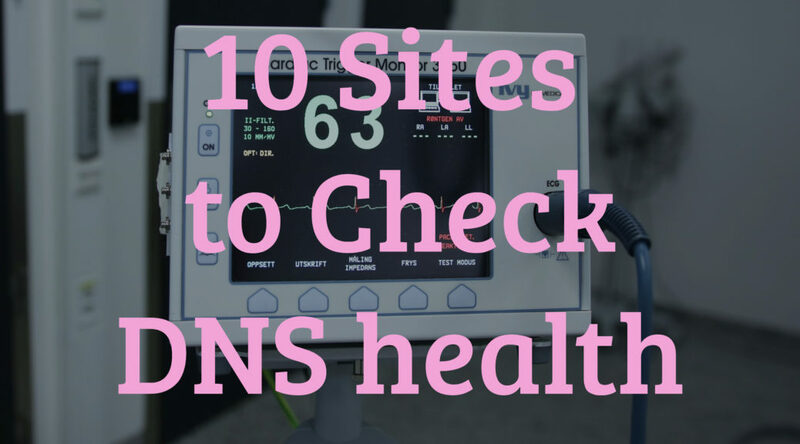 The last tool that we want to cover in this article is DNS health check from network-tools.com. With this tool not only we can input the domain name and dns record type but you can also input the DNS server that you want to query. 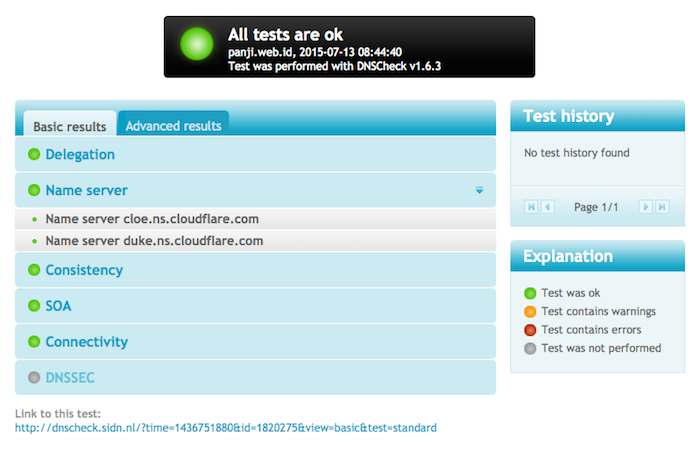 This is especially useful when you try to check whether a specific DNS already give correct result or not. The report does not show the status of your NS health but it report the result that it get from the selected name server. 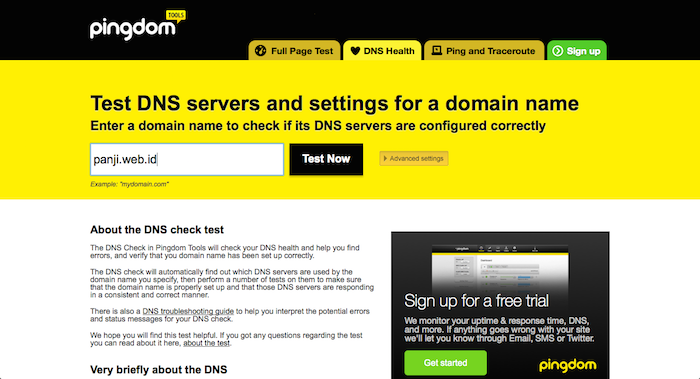 We already learn how to check our domain DNS health using online tools. Hopefully when a friend or a client asking for help about their domain status you already have tool in hand to help them. Hi very nice list indeed! However, I believe you’re missing Monitis http://www.monitis.com/ in the list.